Blount Street. September 2018. A bike lane is planned to be installed this Fall. With planning going back to 2013, the first phase of the makeover for the Blount and Person Street duo should be starting soon. Design work for Phase 1 of the corridor has been completed and last I heard, the construction bids are out now. 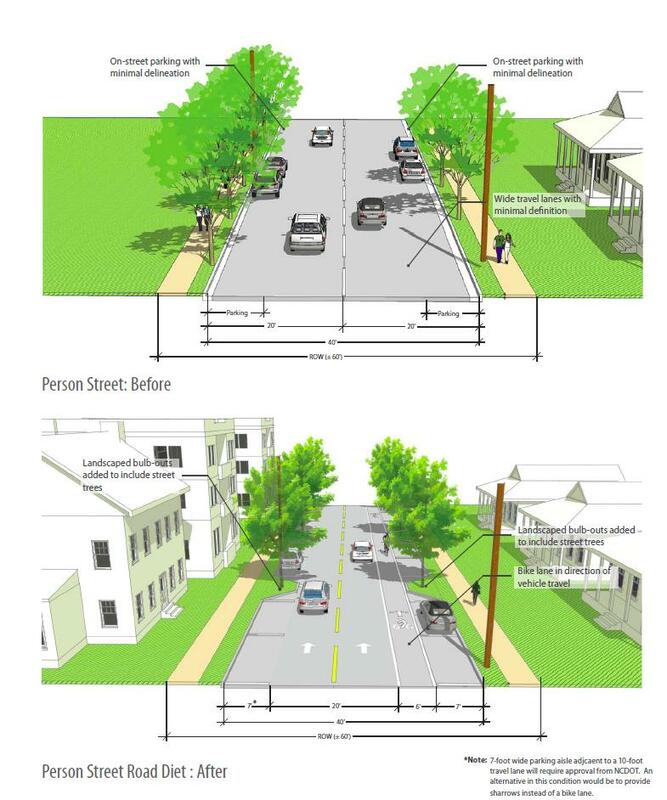 The design of the Phase I Implementation of the Blount Street – Person Street Corridor Study is complete. The project will reconfigure pavement markings and install a continuous bike lane on both streets from Hoke Street to Old Louisburg Road. North of Edenton Street, the streets will be resurfaced and curb ramps will be upgraded. 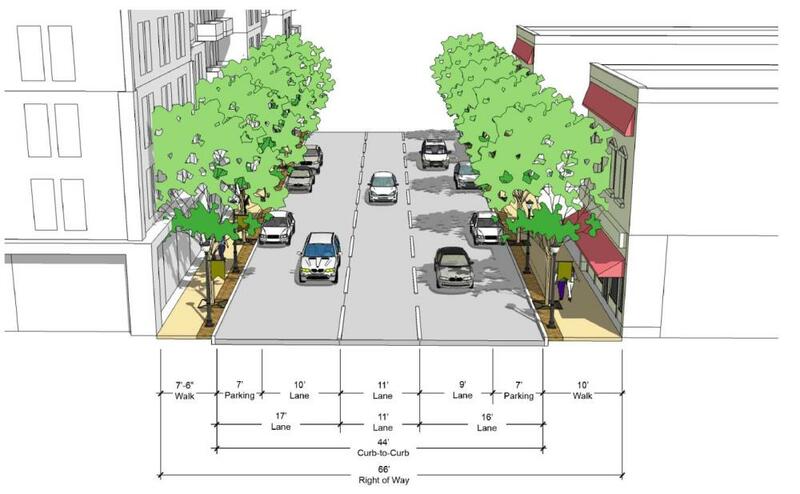 The design of the project will reconfigure Blount Street and Person Street to both have two consistent lanes of standard width. It will also reconfigure Wake Forest Road as a three-lane avenue, with one travel lane in each direction, a center turn lane, and bike lanes. That’s a pretty nice and lengthy bike lane as Hoke to Old Louisburg is almost three miles. Bonus that both streets are getting a lane which offers long rides in each direction. The project should wrap up by the end of the year and then start moving on towards more aspects of the Blount Street – Person Street Corridor Plan. We’re tracking this and other bike lanes on the DTRaleigh community. Join the conversation. 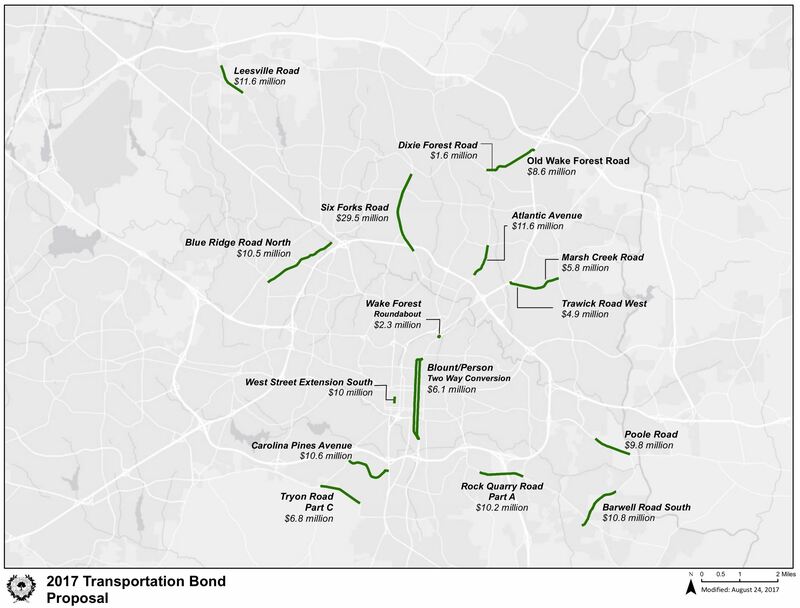 Map of projects as part of 2017 bond proposal. Click for larger. 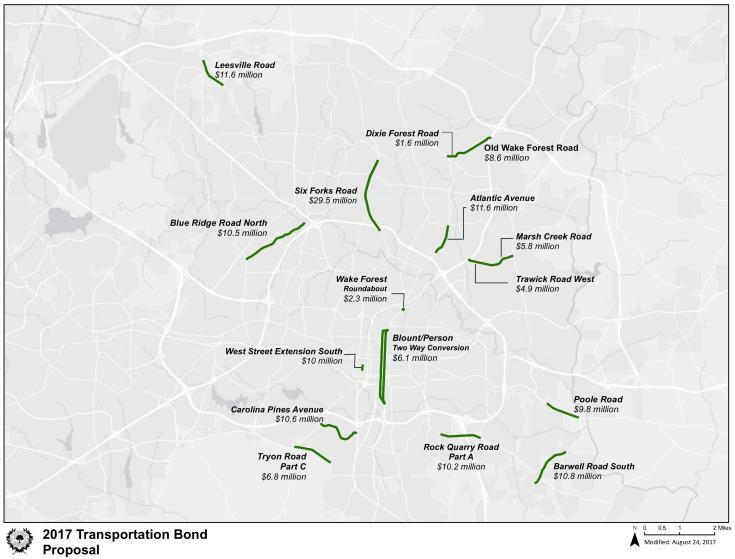 There’s an election coming up and on the ballot for Raleigh residents will be a transportation bond which will include money for upcoming projects around the city and in the downtown area. Early voting has already started but you’ll get your chance to nay or aye this one on October 10. You can dive into all the details about the $206.7 million package here. The map above shows the location of projects with two being in downtown Raleigh. The bond would help direct $6.1 million towards converting Blount and Person to two-way streets. This is probably a result of the work that took place a few years ago, also a result of a transportation bond approved in 2013. I went into great detail on this project in this post. I’m curious to know what the traffic coming off the Hammond Road I-40 exit would be like when Blount and Person are converted to two-way. The theory goes that two roads would absorb the traffic rather than funneling it all down one resulting in improved flow and lower speeds. The bike lanes would also be welcomed in creating easier routes on the east side of downtown. A portion of this funding would allow the City to proceed with the design of the proposed West Street Extension under the NC Railroad Corridor between Martin Street and Cabarrus Street, which provides a critical connection to the upcoming Raleigh Union Station. The remaining funding would allow the City to provide a local match in order to pursue federal grant funding for the project. This is an interesting connection, joining West Street to West Street, that could change the dynamic of the warehouse district. Union Station and The Dillon are already going to have quite the impact so we’ll know over the next few years if the West Street extension will ease off the pressures of a crowded downtown corner. I call it a corner cause the warehouse district really is the corner of downtown, strangled off by the railroad tracks where streets just end. I think Raleigh has a strong history of approving transportation bonds but the question out there is the appetite for more debt after approving an increase of the sales tax for transit during the 2016 election. Either way, voice your opinion on October 10. Here’s a sample ballot for this bond referendum. 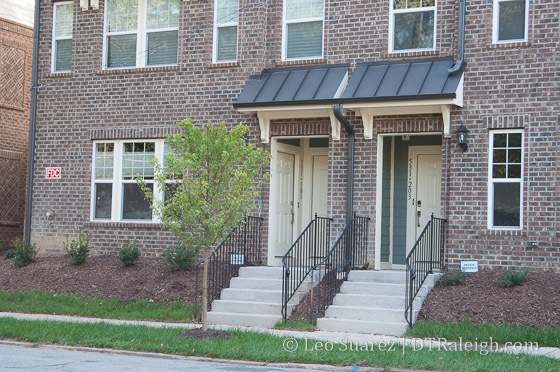 The townhomes on Person Street, as part of the Blount Street Commons project, have been mostly built out. The more northern units look almost done and give us a sense of what they will look like. I am a big fan of these types of residential units and hope to see more, a lot more, in the future in and around downtown Raleigh. Hopefully future projects can have a better sidewalk entrance as these are pretty bare. 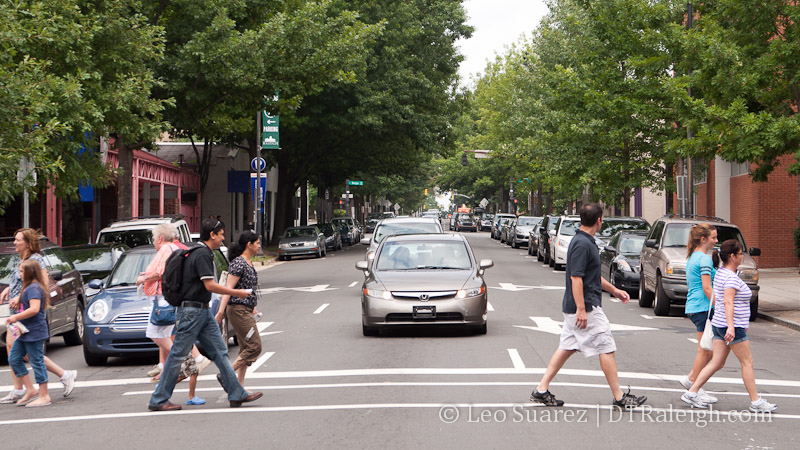 On July 16, 2013, the Raleigh City Council approved the Blount/Person Street Corridor study. The project that includes the two streets from Capital Boulevard down to I-40 along Hammond Road has been ongoing since October 2012. 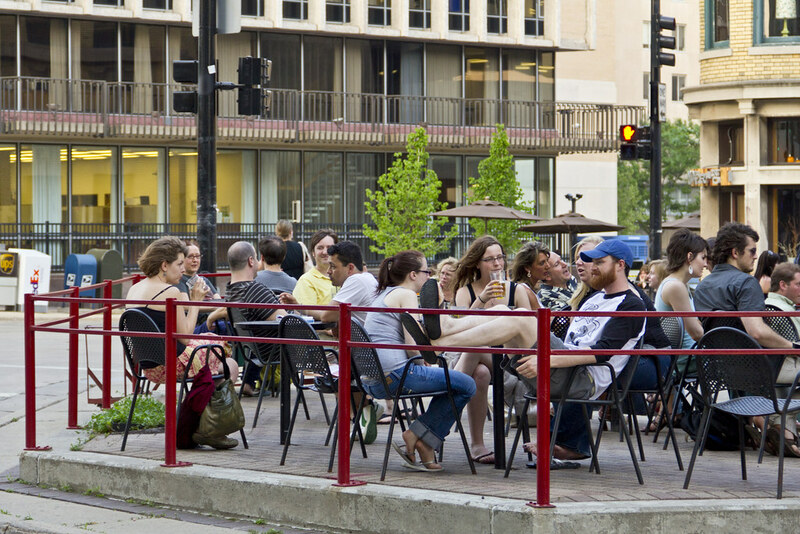 The result could be more multi-modal streets that are phased in as funding becomes available. There are well over 1000 pages of analysis, renderings, and overviews on the project, all available on the city’s website. I thought I’d take the time to skim through and put some highlights of the project here on the blog. One important thing to be aware of is that funding for Phase 1 is included in the Transportation Bond coming to this October’s ballot. That will pay for a re-striping project of Blount and Person Streets that lays the foundation for the One-Way Road Diet plan. As mentioned earlier, the project area starts in the north along Atlantic Avenue near Capital Boulevard, continues down Wake Forest Road to the one-way pairs of Blount/Person Streets and ends at Hammond Road through I-40. Below is map of the area taken from the documents. It’s a lengthy map so click to expand/collapse it. During the July 16 city council meeting, Grant Meacci from city planning gave an overview to the council. You can watch it in the video below. With these themes in mind, two design alternatives have come out that could accomplish the goals of the study. In addition to studying both of these alternatives, the report states that they should not be seen as mutually exclusive but rather steps towards achieving the vision for the corridor. 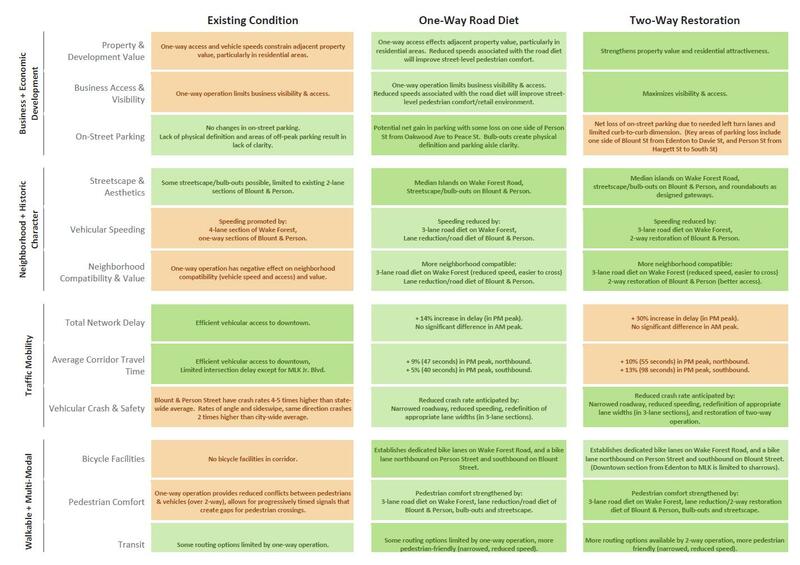 So for example the one-way road diet could be put in now but later, after feedback from the community and further analysis, the two-way restoration could be implemented. The report has a great one-page comparison chart that states the potential negative impacts as well as benefits of each approach. Click on it below to see it larger. To make this all happen, 3 phases are proposed. The sections are broken out so it looks possible to fund them in even smaller steps if necessary. Public participation was a key part of this project and hundreds of ideas and comments were submitted. The report has an exhaustive list of comments that were organized into themes, the ones that helped shape the ones mentioned above. Here are a sample. The report then gets into showing the different “layers” around the corridor including existing land use, popular destinations, open space, parks, and current redevelopment plans. This really shows you the mix of neighborhoods and historic resources that are present in this area. No report is complete without a traffic analysis and the report has a mountain of information including traffic counts, travel time, and level of service. Looks like most of the downtown intersections show pretty good marks with the data taken in 2011. The street design here is a mixed-bag of offerings with streets that have sidewalks and good urban form while others are lacking proper sidewalks. The worst areas were to the south near Bragg and Branch Street as well as to the north near Wake Forest Road and Atlantic Avenue. 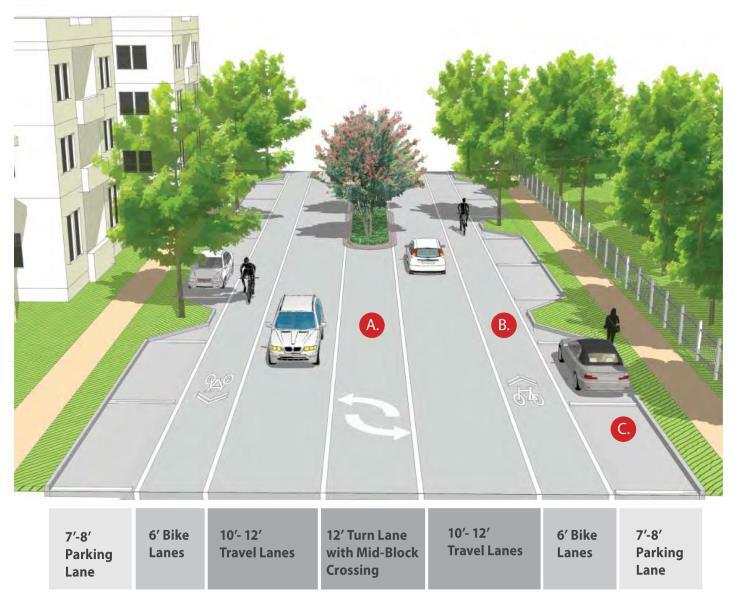 For reference, each section’s current street design within the corridor has an accompanying rendering. 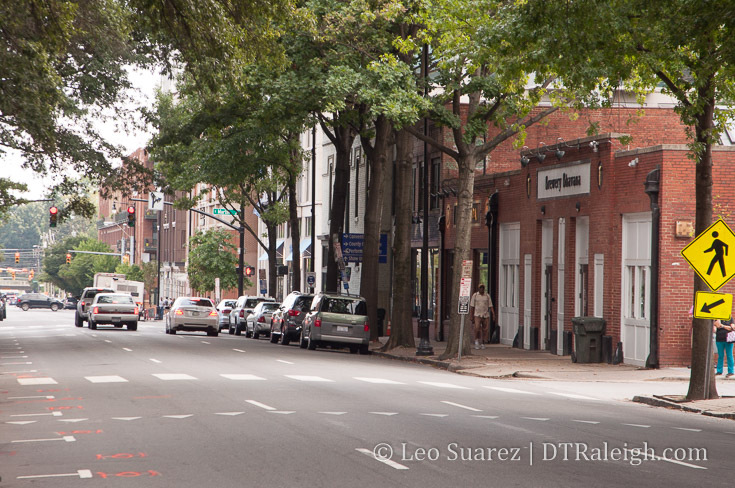 For example, below is Blount Street from Edenton to South Street. Green Streets – Techniques to transform typical street surfaces into stormwater collection system using carefully selected landscaping. The next section of the report gets into the details of transitioning from current conditions to both the one-way road diet and/or the two-way restoration. With roundabouts around Capital Boulevard to the north and improved intersections around Hoke Street to the south, there are also conceptual drawings of what the new Blount/Person streets could look like running through downtown Raleigh. Before and after street cross-section. The Two-Way Restoration plan has a lot going on. Refer to section 3 of the report to see the conceptual designs that include a few more roundabouts as well as possibly slimming down Person and Blount Streets to one-lane in each direction. I do want to re-iterate that further analysis is needed to get to that point but this report starts the conversation. The study wraps up with the traffic analysis. You can dive even deeper into that with the over 1000+ page detailed traffic analysis report for the real municipal geeks out there. The analysis shows how a variety of intersections currently perform and how they are projected to perform under the proposed changes.